City of Jeffersonville to Host Flashlight Easter Egg Hunt This Saturday March 30th! The City will host its first official event at Vissing Park on Saturday March 30th at 7:30 p.m. and the Easter Bunny is working now with The City to hide five thousand eggs! “We are very excited to have our Flashlight Easter Egg Hunt at Vissing Park this year and so is The Easter Bunny! We will begin the hunt at dark and there are over 5,000 eggs to be found. This will be a great way to get to know the new park,” said Sara Schutz, City of Jeffersonville’s Special Events/RiverStage Director. 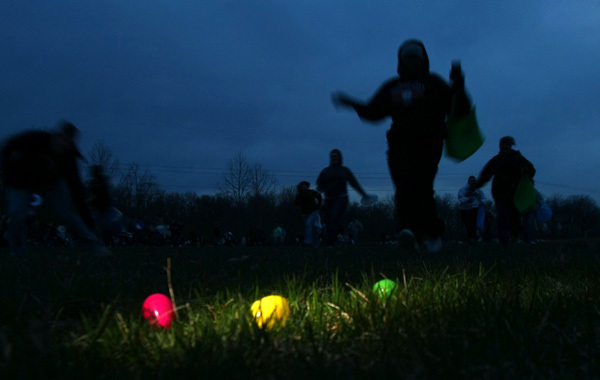 In addition, The City of Jeffersonville announces that it has expanded THE FLASHLIGHT EASTER EGG HUNT to INCLUDE ADULTS. Immediately following the kids hunt, an adult hunt will take place. “We decided that adults should be able to have some fun too! And we’ve got some great prizes which include Jeffersonville Aquatic Center Season Passes, Jeffersonville Ice Rink Passes, gifts cards and more! Ages 18 and up,” said Sara. Vissing Park is located at 2728 Vissing Park Road in Jeffersonville.